The bold details and grand appearance of our Hamilton Court Bed offer a unique, country style that is sure to have a special place in the center of the room. 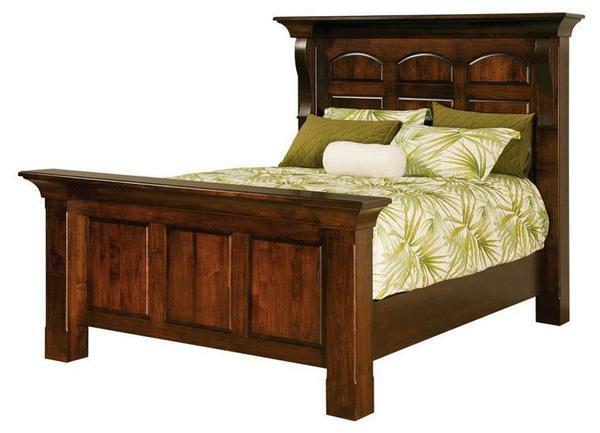 Carefully crafted from pieces of North American hardwood, this bed is made to last generations, offering you an heirloom quality piece that can be loved and enjoyed by family members for years to come. The overall design starts with a large, 69" tall headboard that sets a beautiful backdrop to the entire ensemble. Here, you'll find a mix of old world luxury and modern characteristics with a raised panel design complemented by thick, square legs, ornate corbels in front and topped with a gracefully curved molding that all work together to provide a regal look. Below, at the foot of the bed, a lower 36" tall footboard is capped with the same curved molding on top, thick post legs, and a similar raised panel design - adding the perfect finishing touches to the look. Connecting them both with a firm grip are two solid wood side rails, joined in the middle with a dovetailed slat support system that ensures a lifetime of stability for your mattress and box spring. Incorporate our Hamilton Court French Country Style Bed into any bedroom suite easily by choosing from a variety of sizes, hardwoods, and finish options to create the perfect look. Add a two drawer footboard to the end of this bed and give yourself storage space for bedding, quilts, or any other must-have item handy whenever you need it. Floor to Top of Side Rails: 13"
Floor to Bottom of Side Rails: 7"
Footboard Post Height: (Standard Height) 36"